Social control theory argues that relationships, commitments, values, and beliefs encourage conformity. Internal means of control, such as an individual’s own sense of right and wrong, decrease the likelihood that one will deviate from social norms. Through external means of control, individuals conform because an authority figure threatens sanctions if the individual disobeys. Jackson Toby argued that individuals engaged in non-delinquent community activities felt as thought they had too much to lose by joining delinquent groups and, hence, had a “stake in conformity “. F. Ivan Nye argued that youth may be directly controlled through constraints imposed by parents, through limits on the opportunity for delinquency, and through parental rewards and punishments. Michel Foucault argues that the eighteenth century introduced a new form of power: discipline. Discipline is a power relation in which the subject is complicit. This is contrasted with the previous strategy of regulating bodies but not seeking complicity. Socialization refers to the lifelong process of inheriting, interpreting, and disseminating norms, customs, and ideologies. socialization: The process of learning one’s culture and how to live within it. Social Control Theory: Social control theory proposes that people’s relationships, commitments, values, norms, and beliefs encourage them not to break the law. Thus, if moral codes are internalized and individuals are tied into, and have a stake in their wider community, they will voluntarily limit their propensity to commit deviant acts. Discipline and Punish: Discipline and Punish: The Birth of the Prison is a 1975 book by the French philosopher Michel Foucault. Social control theory describes internal means of social control. It argues that relationships, commitments, values, and beliefs encourage conformity—if moral codes are internalized and individuals are tied into broader communities, individuals will voluntarily limit deviant acts. This interpretation suggests the power of internal means of control, such as one’s own conscious, ego, and sensibilities about right and wrong, are powerful in mitigating the likelihood that one will deviate from social norms. This stands in contrast to external means of control, in which individuals conform because an authority figure (such as the state ) threatens sanctions should the individual disobey. Social control theory seeks to understand how to reduce deviance. Ultimately, social control theory is Hobbesian; it presupposes that all choices are constrained by social relations and contracts between parties. Like Hobbes, adherents to social control theory suggest that morality is created within a social order by assigning costs and consequences to certain actions that are marked as evil, wrong, illegal, or deviant. An internal understanding of means of control became articulated in sociological theory in the mid-twentieth century. In 1957, Jackson Toby published an article entitled “Social Disorganization and Stake in Conformity: Complementary Factors in the Predatory Behavior of Hoodlums,” which discussed why adolescents were inclined or disinclined to engage in delinquent activities. Toby argued that individuals engaged in non-delinquent community activities felt as thought they had too much to lose by joining delinquent groups and, hence, had a “stake in conformity.” The notion of an individual being shaped by his ties to his community, of having a “stake in conformity,” laid the groundwork for the idea of internalized norms that act as a method of social control. Toby’s study was followed in 1958 by F. Ivan Nye’s book Family Relationships and Delinquent Behavior. Nye carried on the tradition of studying juvenile delinquency as a means of theorizing about deviance and social control. Nye conducted formal interviews of 780 young people in Washington State, though his sample was criticized for not including individuals from urban backgrounds and for only selecting individuals who were likely to describe their families unfavorably. Nye focused on the family unit as a source of control and specified three types of control: (1) direct control, or the use of punishments and rewards to incentivize particular behaviors; (2) indirect control, or the affectionate identification with individuals who adhere to social norms; and (3) internal control, or the manipulation of an individual’s conscience or sense of guilt to encourage conformity. Youth may be directly controlled through constraints imposed by parents, through limits on the opportunity for delinquency, or through parental rewards and punishments. However, youth may be constrained when free from direct control by their anticipation of parental disapproval (indirect control), or through the development of a conscience, an internal constraint on behavior. 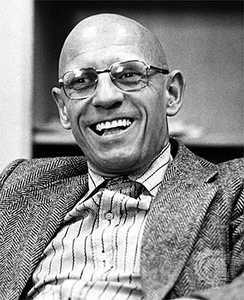 Michel Foucault: In his 1975 seminal text, Discipline and Punish: The Birth of the Prison, Michel Foucault identifies a new form of power introduced in the eighteenth century: discipline. How do individuals develop a particular conscience that promotes social adherence? This is the question taken up by social theorist Michel Foucault in his 1975 seminal text, Discipline and Punish: The Birth of the Prison. Foucault argues that the eighteenth century introduced a new form of power: discipline. Prior to this period, government achieved social control by the mere regulation of bodies. Deviants were controlled by the threat and frequent use of the death penalty or indefinite incarceration. Discipline, however, is a power relation in which the subject is complicit. Rather than the state only regulating bodies, the state began to achieve social control by molding the minds of its subjects such that individuals were educated to conform even when out of the direct gaze of the punishing authority. The training of subjects’ minds occurs broadly in society via socialization, or the lifelong process of inheriting, interpreting, and disseminating norms, customs, and ideologies. Simply by living within a particular cultural context, one learns and internalizes the norms of society. Conformity is the act of matching attitudes, beliefs, and behaviors to group norms. Norms are implicit rules shared by a group of individuals, that guide their interactions with others and among society or social group. Herbert Kelman identified three major types of conformity: compliance, identification, and internalization. Compliance is public conformity, while possibly keeping one’s own original beliefs for oneself. Identification is conforming to someone who is liked and respected. Internalization is accepting the belief or behavior and conforming both publicly and privately, if the source is credible. Obedience is a form of social influence in which a person accepts instructions or orders from an authority figure. Stanley Milgram created a highly controversial and often replicated study, the Milgram experiment, where he focused on how long participants would listen to and obey orders from the experimenter. In the Stanford Prison Experiment, Philip Zimbardo placed college age students into an artificial prison environment in order to study the impact of “social forces” on participants behavior. Stanley Milgram created a highly controversial and often replicated study, the Milgram experiment, where he focused how long participants would listen to and obey orders from the experimenter. In the Stanford Prison Experiment, Philip Zimbardo placed college age students into an artificial prison environment in order to study the impacts of “social forces” on participants behavior. identification: A feeling of support, sympathy, understanding, or belonging towards somebody or something. Social control is established by encouraging individuals to conform and obey social norms, both through formal and informal means. Conformity is the act of matching attitudes, beliefs, and behaviors to group norms. The tendency to conform occurs in small groups and in society as a whole, and may result from subtle unconscious influences or direct and overt social pressure. Conformity can occur in the presence of others, or when an individual is alone. For example, people tend to follow social norms when eating or watching television, regardless of whether others are present. As conformity is a group phenomenon, factors such as group size, unanimity, cohesion, status, prior commitment, and public opinion help determine the level of conformity an individual displays. Harvard psychologist Herbert Kelman identified three major types of conformity: compliance, identification, and internalization. Compliance is public conformity, while possibly keeping one’s own original beliefs independent. It is motivated by the need for approval and the fear of being rejected. Identification is conforming to someone who is liked and respected, such as a celebrity or a favorite uncle. This can be motivated by the attractiveness of the source, and this is a deeper type of conformism than compliance. Internalization is accepting the belief or behavior and conforming both publicly and privately. It is the deepest influence on people, and it will affect them for a long time. Solomon E. Asch conducted a classic study of conformity. He exposed students in a group to a series of lines, and the participants were asked to match the length of one line with a standard line, a task with a very clear right answer. Only one individual in the group was a true student, however – the rest were confederates, or actors that were pretending to be students, but knew the true aim of the study. The confederates were instructed to unanimously give the wrong answer (matching the standard line with an incorrect line) in 12 of the 18 trials. The results showed a surprisingly high degree of conformity: 76% of the students conformed on at least one trial, giving the wrong answer to match the answer of the confederates (who they perceived as actual students). On average people conformed one-third of the time, even in situations where the correct answer was obvious. In human behavior, obedience is a form of social influence in which a person accepts instructions or orders from an authority figure. Obedience differs from compliance, which is behavior influenced by peers, and from conformity, which is behavior intended to match that of the majority. Obedience can be seen as both a sin and a virtue. For example in a situation when one orders a person to kill another innocent person and he or she does this willingly, it is a sin. However, when one orders a person to kill an enemy who will end a lot of innocent lives and he or she does this willingly, it can be deemed a virtue. Stanley Milgram created a highly controversial and often replicated study of obedience. In the Milgram experiment, participants were told they were going to contribute to a study about punishment and learning, but the actual focus was on how long they would listen to and obey orders from the experimenter. The participants were instructed that they had to shock a person in another room for every wrong answer on a learning task, and the shocks increased with intensity for each wrong answer. If participants questioned the procedure, the researcher would encourage them to continue. The Milgram study found that participants would obey orders even when it posed severe harm to others. 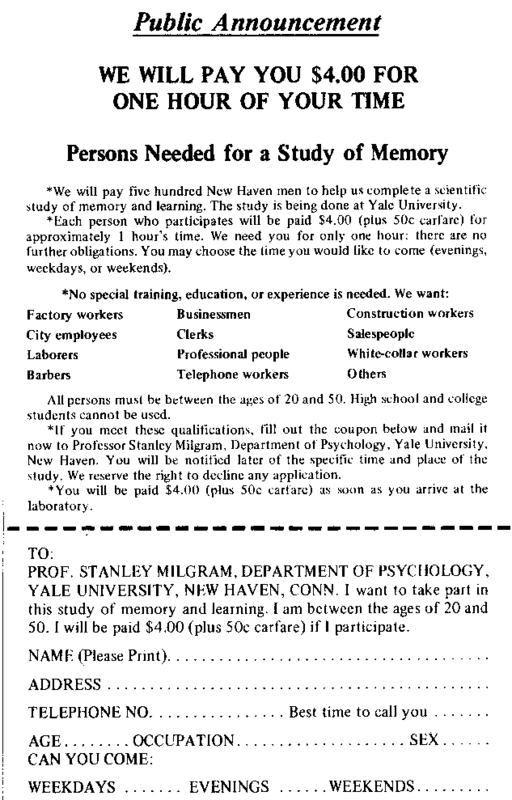 Milgram experiment advertising: In the Milgram experiment, participants were told they were going to contribute to a study about punishment and learning, but the actual focus was on how long they would listen to and obey orders from the experimenter. The other classical study on obedience was conducted at Stanford University during the 1970’s. Phillip Zimbardo was the principle investigator responsible for the experiment. In the Stanford Prison Experiment, college-age students were put into a pseudo prison environment in order to study the impacts of “social forces” on participants’ behavior. Unlike the Milgram study, in which each participant underwent the same experimental conditions, the Zimbardo study used random assignment so that half the participants were prison guards and the other half were prisoners. The experimental setting was made to physically resemble a prison, while simultaneously inducing “a psychological state of imprisonment.” Zimbardo found that the guards in the study obeyed orders so willingly that their behavior turned aggressive. Likewise, prisoners were hostile to and resented their guards, and because of the psychological duress induced in the experiment, it had to be shut down after only 6 days. Informal social control refers to the reactions of individuals and groups that bring about conformity to norms and laws. Informal sanctions may include shame, ridicule, sarcasm, criticism, and disapproval. In extreme cases sanctions may include social discrimination and exclusion. Socialization is a term used by sociologists to refer to the lifelong process of inheriting and disseminating norms, customs, and ideologies, which provide an individual with the skills and habits necessary for participating within his or her own society. The family is often the most important agent of socialization because it is the center of the child’s life. A peer group is a social group whose members have interests, social positions, and age in common. It can also be an important agent of socialization. A peer group is a social group whose members have interests, social positions and age in common. Informal sanctions: These are the reactions of individuals and groups that bring about conformity to norms and laws. These can include peer and community pressure, bystander intervention in a crime, and collective responses such as citizen patrol groups. Informal social control —the reactions of individuals and groups that bring about conformity to norms and laws—includes peer and community pressure, bystander intervention in a crime, and collective responses such as citizen patrol groups. The social values that are present in individuals are products of informal social control. It is exercised by a society without explicitly stating these rules and is expressed through customs, norms, and mores. Informal sanctions may include shame, ridicule, sarcasm, criticism, and disapproval. In extreme cases sanctions may include social discrimination and exclusion. An example of a negative sanction is seen in a scene from the Pink Floyd film The Wall, where the young protagonist is ridiculed and verbally abused by a high school teacher for writing poetry in a mathematics class. As with formal controls, informal controls reward or punish acceptable or unacceptable behavior. Informal controls differ from individual to individual, group to group, and society to society. For example, at a women’s institute meeting, a disapproving look might convey that it is inappropriate to flirt with the minister. In a criminal gang, a stronger sanction applies in the case of someone threatening to inform to the police. Socialization is a term used by sociologists to refer to the lifelong process of inheriting and disseminating norms, customs, and ideologies, which provide an individual with the skills and habits necessary for participating within his or her own society. Primary socialization occurs when a child learns the attitudes, values, and actions appropriate for individuals as members of a particular culture. 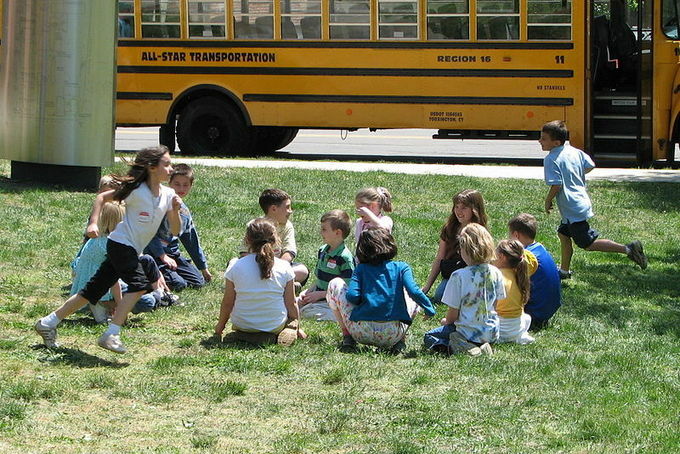 Secondary socialization takes place outside the home, where children and adults learn how to act in a way that is appropriate for the situations they are in. Finally, re-socialization refers to the process of discarding former behavior patterns and reflexes, accepting new ones as part of a transition in one’s life. Group Socialization: Informal social control—the reactions of individuals and groups that bring about conformity to norms and laws—includes peer and community pressure, bystander intervention in a crime, and collective responses such as citizen patrol groups. The family is often the most important agent of socialization because it is the center of the child’s life. Agents of socialization can differ in effects. A peer group is a social group whose members have interests, social positions, and age in common. It can also be an important influence on a child, as this is where children can escape supervision and learn to form relationships on their own. The influence of the peer group typically peaks during adolescence. However, peer groups generally only affect short-term interests, unlike the long-term influence exerted by the family. Formal means of social control are generally state-determined, through the creation of laws and their enforcement. Formal means of control include the threats of sanctions or enforced sanctions manipulated by the state to encourage social control. The death penalty and imprisonment are forms of social control that the government utilizes to maintain the rule of law. Social theorist Max Weber contributed to our understanding of formal social control by writing about the state’s monopoly on violence. In democratic societies, the goals and mechanisms of formal social control are determined through legislation by elected representatives and thus enjoy a measure of support from the population and voluntary compliance. Politics as Vocation: An essay that Weber wrote of the definitional relationship between the state and violence in the early twentieth century. Max Weber: (1864–1920) A German sociologist, philosopher, and political economist who profoundly influenced social theory, social research, and the discipline of sociology itself. Formal means of Control: Formal sanctions such as fines and imprisonment. Formal means of social control are the means of social control exercised by the government and other organizations who use law enforcement mechanisms and sanctions such as fines and imprisonment to enact social control. In democratic societies the goals and mechanisms of formal social control are determined through legislation by elected representatives. This gives the control mechanisms a measure of support from the population and voluntary compliance. The mechanisms utilized by the state as means of formal social control span the gamut from the death penalty to curfew laws. From a legal perspective, sanctions are penalties or other means of enforcement used to provide incentives for obedience with the law, or rules and regulations. Criminal sanctions can take the form of serious punishment, such as corporal or capital punishment, incarceration, or severe fines. Within the civil law context, sanctions are usually monetary fines. Our understanding of formal control is enhanced by social theorist Max Weber’s work on the state’s use of violence. Weber writes of the definitional relationship between the state and violence in the early twentieth century in his essay “Politics as Vocation. ” Weber concludes that the state is that which has a monopoloy on violence. By this, Weber means that the state is the only institution within a society who can legitimately exercise violence on society’s members. When Sam kills Katie, he is a criminal guilty of murder. When the state kills Katie, it is enacting its authority to use the death penalty to protect society. Weber uses this definition to define what constitutes the state. The formal means of social control and the monopoly on violence serve a similar role in defining the state—they both illustrate the unique relationship between the state and its subjects.